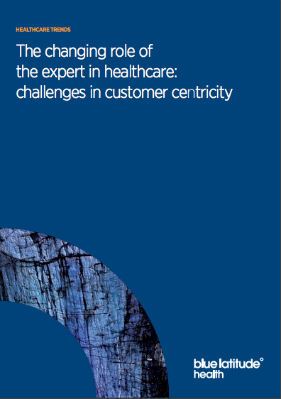 Putting the customer at the centre of care has been the topic of many conversations in healthcare for a few years now. From bringing healthcare professionals, who make critical decisions about treatment and care, into focus, to empowering patients to be more proactive in their care, to implementing organisational change to support it – customer-centricity is here to stay. However, when we talk about customers as experts in healthcare, what we’re really talking about are clinicians. Experts in diagnosis, treatment and clinical care (HCPs) and experts as those who experience the medical condition in their own personal context (patients). Both of these groups are vitally important to getting treatment right for the condition and context of each individual patient. This represents a shift in how we view ‘experts’ in healthcare, and indeed, the required shift in the system that services them. Head of Customer Experience Elisa del Galdo talks through how the evolution of the relationship between HCPs and patients is changing the role of the expert in healthcare. Through our own work with patients and HCPs, we know that there is a mismatch between what physicians are trained to do (treat a condition), and the sum of what patients are seeking from their physicians. Not only does a patient expect to be treated for their aliment, but they also crave a relationship with their HCPs to better understand their condition. They also want to know what they can contribute to their wellbeing, and feel that it is a collaborative relationship. They want to feel empowered and informed. From the HCP perspective, their role is to understand the symptoms, diagnose the problem, and treat the patient for a specific condition (or set of conditions) to the best of their ability. Once a diagnosis has been handed down, and a treatment plan decided upon, and the patient is cured or monitored, their job is finished. For a patient, this process can make them feel as if they are a condition with a patient attached, with no needs outside of treatment, no opportunities to contribute, nor have a say. However, the advent of the internet has provided an easily accessible way for patients to become better informed about their condition and treatment options. It has also increased patients’ appetite for more, higher quality information about conditions, treatments, and the actions that they can take to support their treatment. Patients’ access to the internet not only provides a wealth of information, but is a game-changer in that it gives easy access to people just like them – connecting patient groups via forums and chat rooms to share their problems, concerns, experiences and advice. Here, their personal context is taken into consideration, and they are more than a condition, but without any ability to know which information (or person) is relevant and credible. What this mismatch leads to is an inherent conflict in the relationship between patient and HCP; the patient may come armed with information about their condition that the HCP has not seen, and which the HCP cannot verify as credible. This makes the HCP resistant to let the patient into the process, alienating them from their own care. The patient may also ask them questions about alternative remedies, complementary treatments, changes in lifestyle, etc., but this is usually an area that the physician has not been trained in and is not able to consult on. The physician may also be prescribing treatments that, due to a patient’s personal needs or wishes, makes it difficult for them to adhere to. Both situations can result in a less engaged patient.